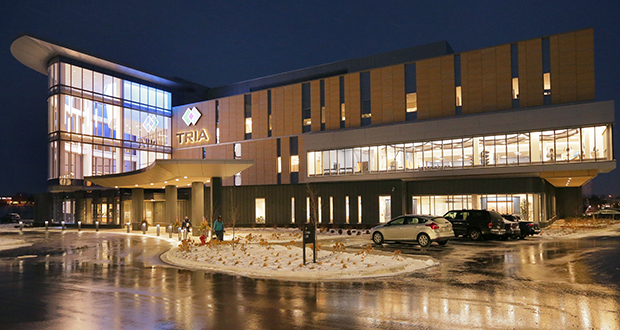 When drivers pass the TRIA Orthopedic Center in Woodbury during Minnesota Twins games, they can see a display of the team’s colors lighting the building’s glassy, three-story circular lobby. Other days the lights are a blue shade of TRIA’s brand. If the Minnesota Wild hockey team has a game, the atrium is cast in red and green. 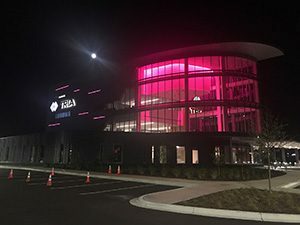 The TRIA clinic joins several buildings in the Twin Cities that have added jazzy, multi-colored exterior lighting to build their brands and create a bit of eye-catching pizzazz. It’s not just for the holidays either. Among the buildings that have added decorative exterior lighting are Mayo Clinic Square (600 Hennepin Ave., Minneapolis), Radisson Blu (35 S. Seventh St., Minneapolis), the Bonestroo Building (2355 Highway 36 W., Roseville), OATI Microgrid Technology Center (7901 Computer Ave., Bloomington) and The Finn Apartments (725 Cleveland Ave S., St. Paul). Even in the season of holiday lighting it’s hard not to notice the all-year-round lighting these buildings provide. Scientific research has shown people often recognize a brand through color and light. McCallum said the right shade of red makes people “think of Target,” a company that coincidentally has perhaps the largest lighting experience in the region atop its headquarters building at 33 S. Sixth St. in downtown Minneapolis. 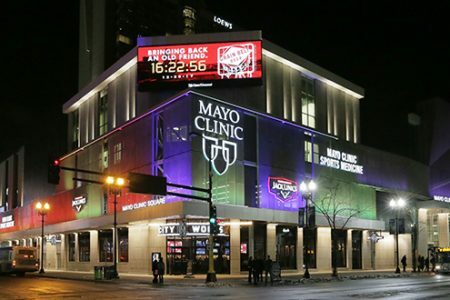 The lighting on Mayo Clinic Square made sense because of the competing marquees along Hennepin Avenue. 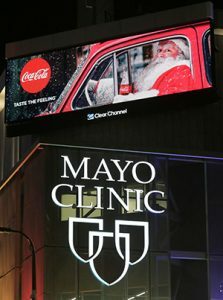 It allows Mayo to display color to highlight its brand or events such as the game nights of the Minnesota Twins and Timberwolves. 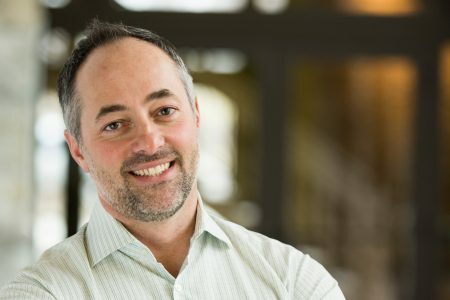 “Lighting gives you the ability to make a building adaptable to its surroundings,” Serrano said. 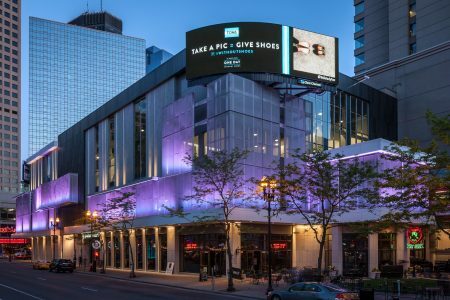 On the Mayo building’s skin, RSP used a “scrim” that fills out the building at corners while being able to both receive light and hold it, making for a stronger visual display. The scrim “is a canvas for paint, but you’re painting with light,” Serrano said. The architects said the lighting itself does not add much cost. The programming of the lighting, however, can add up. Not all buildings require or need such sophisticated lighting. The Baker Center’s new lighting scheme – part of the redevelopment of the building – simply highlights the exterior’s architecture without involving color. “It’s not a rear-end-the-guy-in-front-of-you kind of dramatic lighting. But it’s so appropriate — and it makes sense,” Serrano said. Selecting the right kind and amount of light matters greatly. “There’s a fine line between Las Vegas” and what’s appropriate for commercial areas, McCallum said. 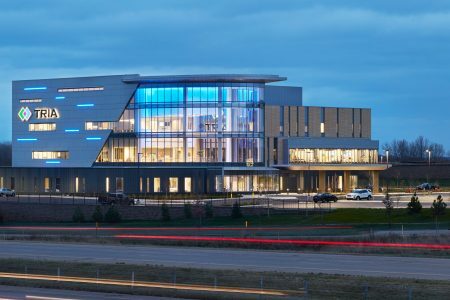 For TRIA, at 155 Radio Drive in Woodbury, the concept involved using the three-story, glass-enclosed lobby as a “beacon” to grab the attention of drivers, Serrano said. 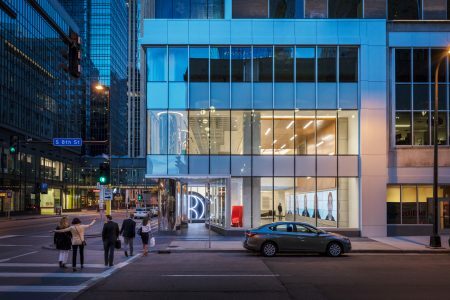 RSP also worked with Jack Link’s new corporate office in Mayo Clinic Square. 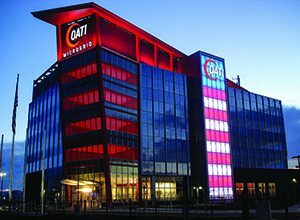 Exterior signage cast its trademark red into a corporate boardroom, McCallum said, adding yet another dimension to the brand’s lighting experience. The Finn Apartments is a bit different. Located in St. Paul’s Highland Village, the multicolor light tower that periodically changes hues near the middle of the 57-unit building is the most interesting exterior lighting display in the surrounding area. It’s enough of a draw that tenants have sought to live in apartments adjacent to it, said property manager Liz Oxendale. The lights go off at 10 p.m., Oxendale noted, adding she can modulate the brightness. The neighbors have lodged no direct complaints about the lighting, she said, and many have said they welcome it as a nice visual addition to the area. One reason for The Finn’s popularity may be that it faces commercial buildings across the street rather than residential housing. That’s been the case with other Ackerberg properties with lighting displays, such as Calhoun Square (with a lit crown that changes colors) and the illuminated obelisk nearby at the MoZaic office building (2900 Fremont Ave. S., Minneapolis). Ackerberg still appreciates the classic lighting of the Wells Fargo Center, which shows off the building’s exquisite profile. Sometimes buildings lit well end up looking better at night than during the day. 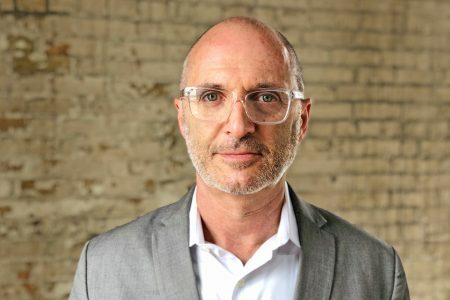 “Good lighting is a tool, a technique,” he said.